As resources decline and living expenses increase, there is a renewed push to embrace renewable energy sources. The sun provides us with one of the most efficient forms of energy, transformed into a usable power supply with the help of solar systems. 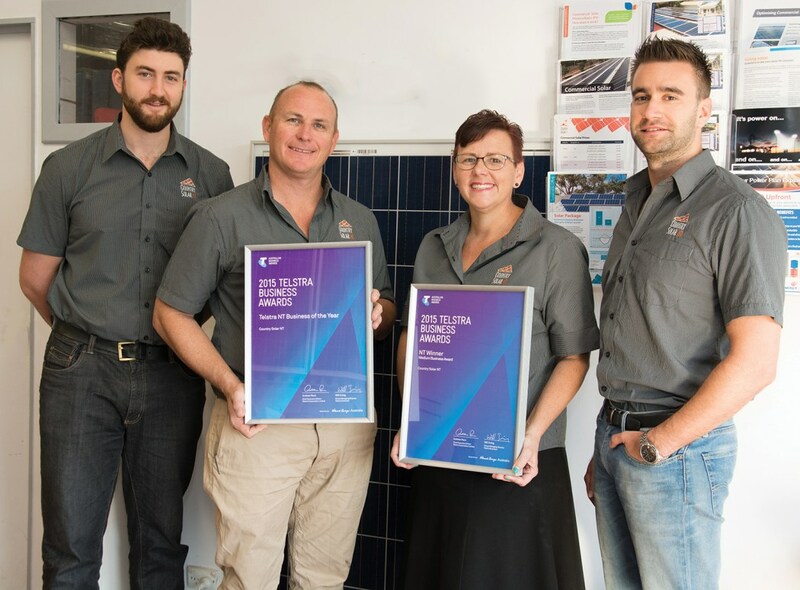 Leading the way in bringing the power of the sun to the people of the Territory is Country Solar NT – the 2015 Telstra Business Awards NT Business of the Year. The family-owned Darwin business also took out the Medium Business Award, proving its excellence in the field. Owner Jeremy Hunt attributes the success to flexibility and an unwavering commitment to customer satisfaction. Despite changing government policies and market volatility, Country Solar NT has grown from a small home-based business to a thriving company with a team of 26 staff in just five years. “Our industry has been likened to a roller coaster, and we’re constantly dealing with twists and turns and having our goal posts shifted,” he says. Challenges aside, the solar industry has welcomed vast technological advancements and system improvements over the years. Jeremy says increasing storage capabilities of solar energy is particularly impressive, paving the way for the introduction of batteries strong enough to power entire homes. Country Solar NT is the provider of choice for both residential and commercial properties across the Northern Territory, including major corporate and government contracts. It’s a major vote of confidence for the local family-owned business. Jeremy says the business’ local connections and personalised service was crucial to building that trust. “We have a lot of local knowledge and a local presence in Darwin itself, which has been important for people being able to walk in and talk to us,” he says. Despite the success, Jeremy admits he never expected a win at the Telstra Business Awards, instead entering just as a learning experience and opportunity to identify new pathways for growth. “It is a huge honour and we are fairly humbled by that,” he says.